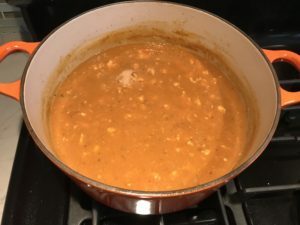 Let me start by saying, the original non-freezer version of this Creamy Tomato Soup recipe is one of my most popular and loved recipes. 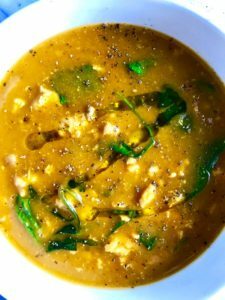 I first developed and posted this recipe in February, 2018, which you can check out HERE. This time, I have revised it to be prepped and frozen ahead of time, then thawed and cooked when you are ready. 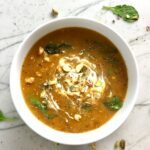 The original recipe took time to layer in the ingredients giving each its own time to cook before the next was added. For this freezer meal version, I added all ingredients except for the flour, spinach, and chicken, into 1 freezer bag. But let me tell you, the flavor is still unbelievable! There is just something about the way the tomato paste brings in that subtle, but deep tomato flavor in the perfect way. Dice the onion and mince the garlic. Place in a labeled Freezer bag or 2 Quart Storage container. Add the tomato paste, chicken broth, and oregano. Seal the bag tight. Place this freezer meal in the freezer flat to freeze. 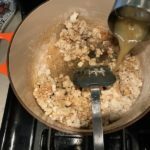 To get the best flavor from your ground chicken, you really want to brown it alone first and then add the broth to soak up all that browned flavor. That means you need to freeze the chicken separate from the other ingredients so it can cook separate. You can freeze the chicken in it’s existing packaging, but if it’s thick, it could take longer than 1 day to thaw. You can either put it in the fridge to thaw 2 days prior to cooking or transfer it to a freezer bag and break it up to a flat single layer. 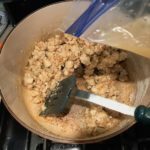 Label the Ground Chicken Package for this recipe and also place in the freezer near the prepped meal. I love FreeBird 98% Fat-Free Ground Chicken Breast, Raised w/o Antibiotics that I can get through Fresh Direct. 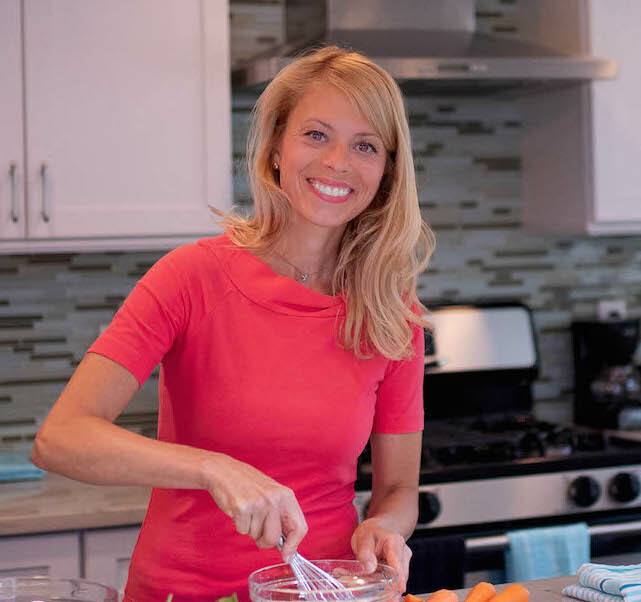 I have said it before, but Fresh Direct is a life saver for busy Moms and they source from sustainable local farms which I feel great about. If you’re not a member, click this link for a discount to join! Get $25 Off Orders of $99 with code LEAF25 at FreshDirect! 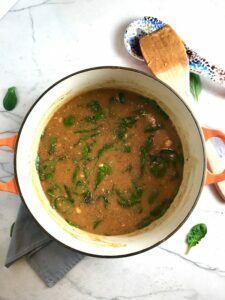 You will also need to hold back from freezing the All Purpose Flour that is the thickener in this soup and the Spinach which will become mush in the freezer. 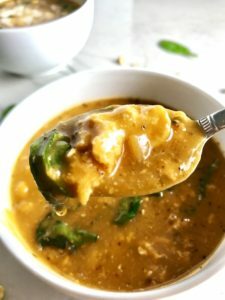 When you are ready to make this meal, thaw your frozen Creamy Tomato Soup bag and Ground Chicken in the fridge overnight and the next day. Do not thaw out of the fridge at room temperature, as that invites bacteria. 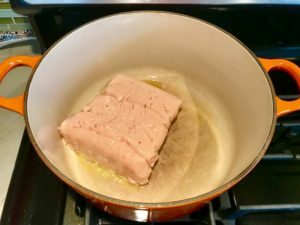 To a preheated large soup pot or dutch oven, add 1 tablespoon extra virgin olive oil, then the ground chicken. Break up the meat with a spatula or spoon. Sprinkle in 1/2 teaspoon of salt and 1/2 teaspoon of fresh ground pepper. Stir the chicken until brown on all sides. Let it get REALLY brown on the bottom of the pan, about 10 minutes. Add the flour to the meat and stir to mix it in. Then add 1 cup of the broth mixture to the pot and stir to moisten and start to thicken the flour. 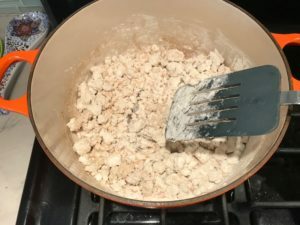 Add all of the remaining contents from the freezer meal container and stir until completely mixed, making sure to scrape up any chicken and flour bits that are stuck to the bottom. Partially cover so steam can escape and cook for 20 minutes, stirring a couple times during. 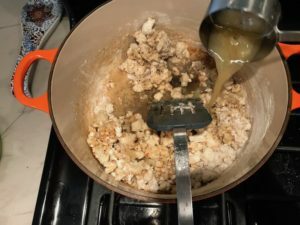 The mixture will get thick and creamy. Add the spinach leaves to the pot and stir in. They will wilt perfectly within a minute. Taste for seasoning and add salt and pepper to taste. Garnish with Olive Oil or sour cream and fresh ground pepper. 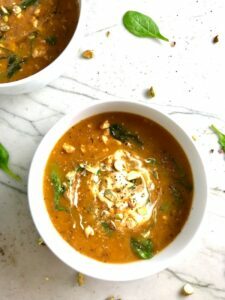 This Creamy Tomato Soup with Ground Chicken and Spinach is creamy, chunky, flavorful, and healthy! 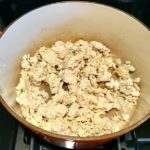 It uses all white meat ground chicken that you cook until it is incredibly browned for some serious flavor. Then tomato paste adds the flavor back drop for the soup and a flour roux plus broth creates the amazing creaminess! Finally Spinach is your veggie boost. You can freeze the chicken in it's existing packaging, but if it is a not broken up and frozen flat, it may take longer than 1 day to fully thaw in the fridge. You can either put it in the fridge to thaw 2 days prior to cooking or transfer it to a freezer bag and break it up to a flat single layer. 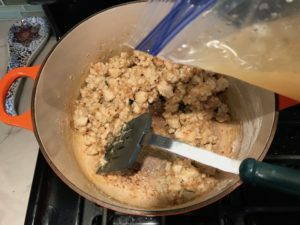 Label the Ground Chicken Package for this recipe and also place in the freezer near the prepped meal. When you are ready to make this meal, place the chicken and the freezer meal container in the fridge to thaw overnight and the next day. Note, you may need longer to thaw the chicken if left in original packaging. 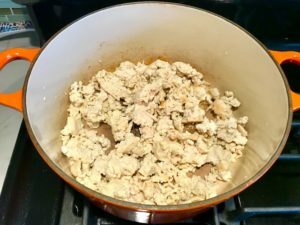 Stir the chicken until brown on all sides. Let it get REALLY brown on the bottom of the pan, about 10 minutes. Add the flour to the meat and stir to mix it in. Then add 1 cup of the broth mixture to the pot and stir to moisten and start to thicken the flour. 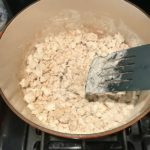 Add all of the remaining contents from the freezer meal container and stir until completely mixed, making sure to scrape up any chicken and flour bits that are stuck to the bottom. Garnish with sour cream and fresh ground pepper. < Previous Hanky Panky Canapes, the Best Party Appetizers!